For Patricia Mabee, who adores Vivaldi’s The Four Seasons but isn’t quite so infatuated with commuting through all of them, “winter” in LA is thankfully a gentle term. It doesn’t involve a thick parka rated to 10 below zero. No slushy streets. Freezing her fingers because of forgotten gloves? Not a chance. 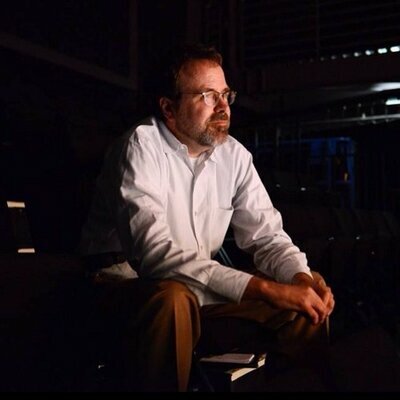 For that, the longtime Los Angeles Chamber Orchestra principal keyboard has to get out of town. 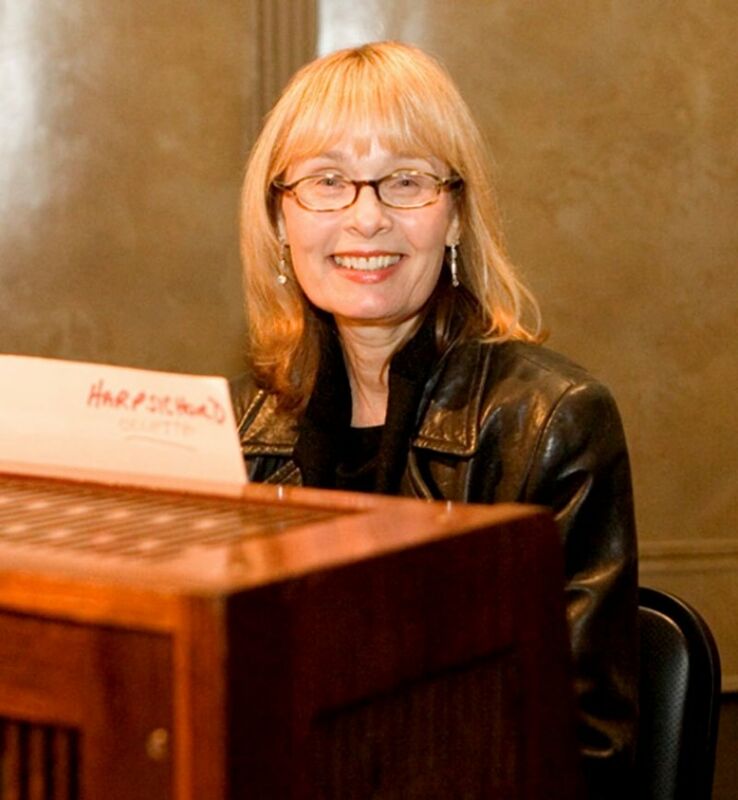 Patricia Mabee has been principal keyboardist since 1976, and has appeared in more than 20 works from the concerto repertoire under the batons of Sir Neville Marriner, Christopher Hogwood, Helmuth Rilling, Nicholas McGegan and Iona Brown. Then it’s back to Los Angeles, which has, at the most — two seasons? One? The matter is up for debate. Antonio Vivaldi wrote his famed The Four Seasons when he was living in Mantua, Italy, a place that definitely has all four. After experiencing hot, humid summers and freezing winters, it’s no wonder he was always so glad to see spring and autumn (especially without air conditioning or central heating). Vivaldi probably would have loved the weather in LA Everyone else does, right? Patricia, who’s played The Four Seasons for LACO seven times during her 42-year tenure with the Orchestra, is “mainly a SoCal girl,” but she did live in a small Colorado town for three years, so she knows her traditional seasons. She remembers sledding, ice skating and making “snowpeople.” In the spring she watched for bird nests. Many artists throughout history have felt the same way. In the four violin concerti that make up Vivaldi’s piece, the composer offers narrative elements inspired by seasonal changes around him: rushing streams, buzzing insects, singing birds, drunken dancers, thundering storms, a dog barking while his goatherd master sleeps. Painters, composers, choreographers, poets, filmmakers and other artists have long been intrigued with the theme of the four seasons, and not just in the literal sense of green shoots breaking through the soil or leaves turning a golden brown. Mantua is a city in Lombardy, Italy, and capital of the province of the same name. 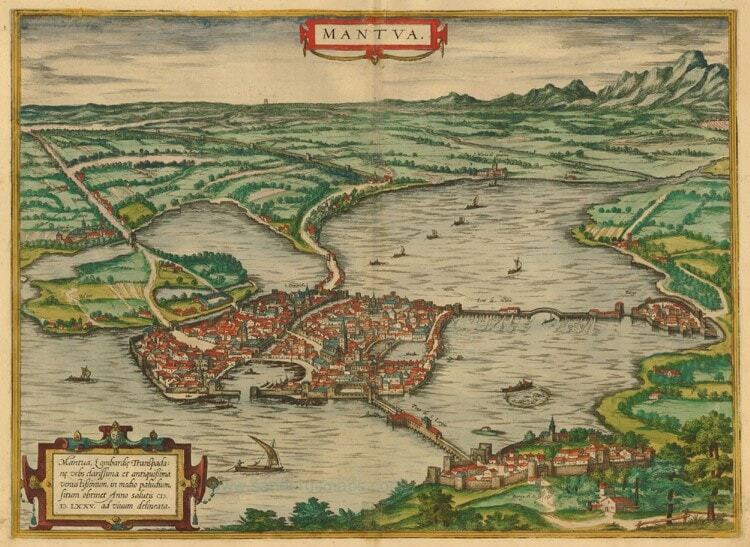 The engraving shows a bird’s-eye view of a city in the middle of a lake. It also the city where Vivaldi composed the Four Seasons. From a biological and cultural standpoint, the idea of the seasons is a powerful influence, even for people who don’t live in climates that offer the “traditional” lineup of fall colors and white Christmases. In a more contemplative sense, the seasons at their most fundamental can symbolize the circular nature of life: from birth to death. That’s often what draws artists to the theme, from Nicolas Poussin to David Hockney and Jasper Johns. Johns’ set of four intaglio prints, The Seasons (Spring, Summer, Fall, Winter), was part of a recent retrospective of the artist’s work, Something Resembling Truth, at The Broad museum in downtown Los Angeles. The four panels, painted in 1985-86, are filled with seasonal symbols and art history allusions. You can find the obvious (a snowman in Winter) to the more subtle (in Summer, look closely at the American flag, which is a famous subject for Johns, because it only has 48 stars). Sprinkled through the works are seahorses, recurring allusions to Picasso, streaks of rain, and, in each one, a branch with blossoms, leaves, or no growth at all, depending on the season. Johns puts his own figure into each of the four paintings, an autobiographical touch. For Ed Schad, who curated The Broad exhibition, Johns painted not with whimsy but “spirit and grace,” he says. “It’s emotional, rather than something that’s analytic.” When the series was first displayed in New York, the paintings were hung in “traditional” order: spring, summer, fall and winter, or what you could call the traditional birth-to-death progression. But the Broad, in consultation with the artist, hung them differently: summer, fall, winter, spring. 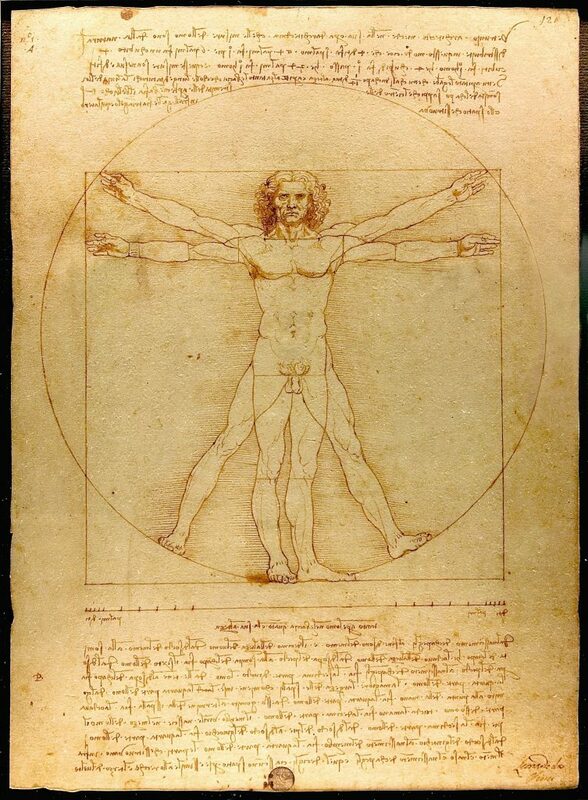 The Vitruvian Man (Italian: Le proporzioni del corpo umano secondo Vitruvio, which is translated to “The proportions of the human body according to Vitruvius”), or simply L’Uomo Vitruviano, is a drawing by the Italian polymath Leonardo da Vinci around 1490. The seasons, then, stay the same. But each individual journey through them is as one-of-a-kind as the snowflakes you find in Winter. When you talk to the experts, you’ll find that our relationship to those seasons is both biological and cultural. In some ways, we’re like birds that instinctively know it’s time to fly south (or at least to the nearest Macy’s gift-wrapping department). Over the course of millennia, humans have adapted both genetically and environmentally to the regions to which our gatherer-hunter ancestors migrated, says Dr. Andrew Jones, a sociology professor at California State University, Fresno. We also behave in certain ways depending on the season, taking cues from our surroundings. Our acknowledgment of seasons in the northern hemisphere is subject, then, to cultural construction. Along with the obvious holidays and seasonal transitions (Halloween just seems more fun when there’s a chill in the air), we also receive cues as to what season it is by the availability of goods. Fashion tends to run one to two seasons ahead, for example. “If the clothing racks in stores have summer fashions on display, it must be winter, and if coats are on display, it must be summer,” Jones says. This is marketing strategy, yes, but it’s based on human nature: people like to plan ahead, and they also get antsy. In February, who wants to think about buying yet another sweater? Then there’s the question of why there are four seasons. It’s not necessarily a given. Different calendars around the South Asian countries of India, Bangladesh, Nepal and Sri Lanka, recognize six seasons or ritu: Vasanta (spring), Grishma (summer), Varsha (rains/monsoon), Sharad (autumn), Hemanta (winter), Shishira (cool season). For instance, the Hindu calendar recognizes six seasons. In India there is summer, monsoon, autumn, late autumn, winter and spring, Jones says. The Bengali and Tamil calendars also recognize six seasons. Scandinavian countries denote seasons by temperature – winter begins when the temperature does not rise above zero degrees Centigrade; summer when the temperature rises above 10 degrees Centigrade. The Sami of northern Scandinavia have seasons that correspond to the life cycle of reindeer, and thus, acknowledge eight different seasons. 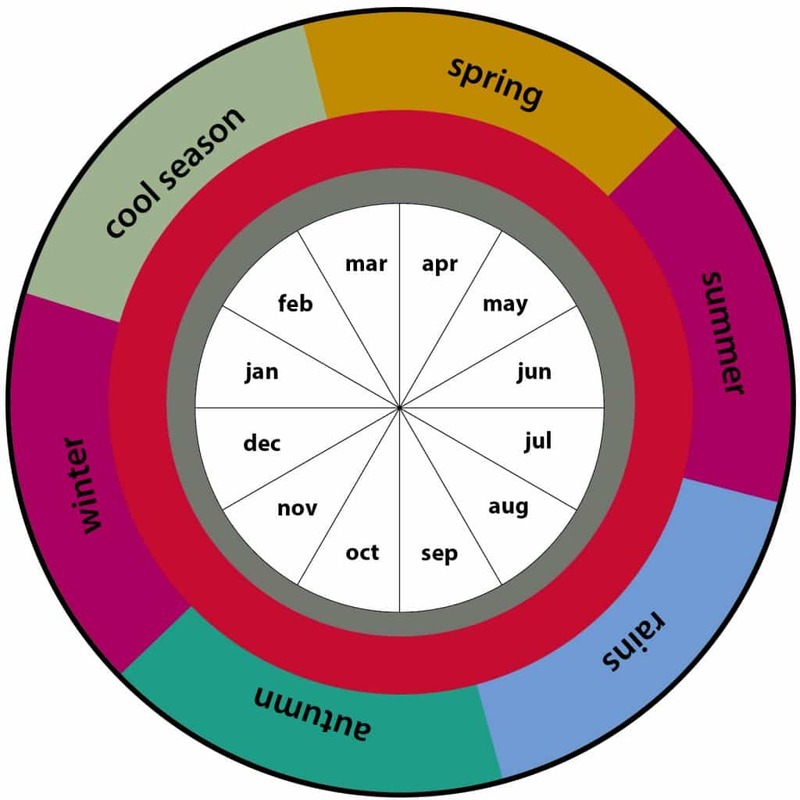 The eight seasons of this cycle are directly related to the annual behavioral patterns of the reindeer. There isn’t any Arctic wildlife wandering the freeways of Southern California, of course, but Angelenos have other ways of demarcating the seasons. At The Broad, Schad pondered the subject during the run of the Jasper Johns show. That’s because so many people in Southern California are transplants, bringing their own traditions along, he speculates. From seasonal menu items to the way people dress, the area is a melting pot of seasonal customs. “A lot of the ways that people mark the seasons are kind of grandfathered in for Los Angeles,” he says. Patricia, the LACO principal keyboard, can’t think offhand of any quirky seasonal traditions of her own. Temperate weather is just fine by her. “I wear my big fluffy slippers all year round,” she says. “If we get the OK from the leader, it’s an opportunity to improvise a bit of an interpretation of the drunkard’s dreams under the surface of the somnambulant strings,” she says. “There really is no melodic material, so we take our cues from the harmonies. They begin placidly, meandering. That full cycle — placid to dissonant to total calm — fits in rather nicely with the theme of Johns and other artists who have been drawn to the rhythm of the seasons. It’s an idea that has traction wherever you live, regardless of whether you ever need snow tires. Schad lives in Culver City near a movie studio, and one night he came home from work to find his entire block covered in fake snow. That’s Los Angeles for you. Writer Donald Munro has had a career in journalism for the past three decades. A California native, he went from being the student editor of Cal Poly’s Mustang Daily to an arts journalism grad student at Columbia University to a local arts critic in Fresno. He can be reached for comment at donaldfresnoarts@gmail.com. Join Los Angeles Chamber Orchestra and Grammy-nominated mandolinist Avi Avital for Vivaldi’s timeless masterpiece.